Ingredients = Stencil, salt water, water sprayer / pump, and a good lookin’ piece of pavement. 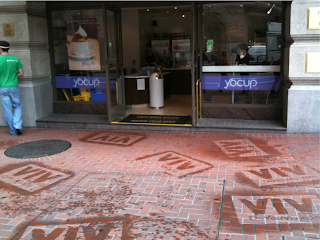 Directions = Find high traffic area; Lay down stencil; Mist (gently) with water; Lift; and Ta-Da! (graffiti typically lasts for ~15 minutes before evaporating). 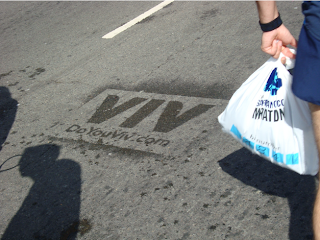 So next time you spot us on the streets, get that urban rebel out of you and come “clean up” SF’s streets with some Viv Eco-graffiti.